Dress Up, Chow Down.. The 2015 Poster Has Arrived! 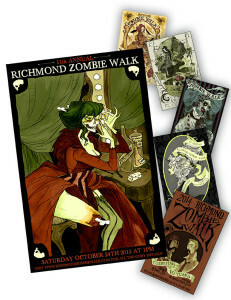 The official 11th Annual Richmond Zombie Walk poster has arrived! Created by the horribly wonderful illustrator Abigail Larson. The 2015 poster will be available for $5 or you can get the entire set of 6 posters for $20 at the event on Saturday, October 24th. All proceeds go to The American Cancer Society. And if that wasn’t enough, Abigail will be there to autograph them. Visit our event page here on Facebook or RichmondZombieWalk.com for all the gory details. See you there!